There are many reasons why going back to school is a good idea, to further your education, finish off an unfinished degree, make a career change, or simply to upgrade your resume. For some of us, it may have been quite some time since we last sat down in a lecture hall taking notes with paper and pen. Just by saying, taking notes with paper and pen I’m probably dating myself, especially with the recent news coming out of Apple. With the ability to search digital textbooks with standard computer searching parameters that we are all familiar with, you will spend less time looking for a specific reference and more time applying the knowledge that you found. As previously mentioned, the now archaic paper textbook is typically out of date before it even comes of the press. With the new digital textbooks, updates can be made on the fly with a simple download. Although tablets may still be a bit pricey, the costs associated with digital textbooks far outweighs the initial investment that the education system may have to incur to get a ‘tablet in every hand’. With Apple’s iBookstore℠ pricing textbooks at $14.99 or less, soon the days of the $100 textbooks that are only current for one semester. will be a thing of the past. A digital textbook can now be created 100% virtually, without the need for paper, ink, or a printing press. Not only are digital textbooks environmental in the way that tress will not have to be cut down to produce them, but older textbooks will not have to end up in our landfills, as a digital textbook is updateable, and does not create any physical waste. And it’s about time! I remember having to lug a huge school bag full of heavy books around as a school goer. 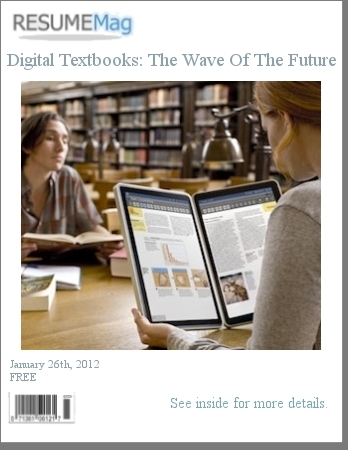 Digital textbook have so many advantages, it will be really interesting to watch where this goes.